Keeping up with with our recent travels is an adventure all by itself for us. It was too hard for us to really post good travel pages in a timely fashion, but there are sometimes quick, funny travel tales that we think you'd enjoy. ...and so you'd know why sometimes we haven't written anything new about our travel or tips for days or weeks! But we needed to change the focus from keeping up with our travels to random travel tales. So OK... we have a few random travel tales below. They are stories that don't really deserve a page of their own, but they were just fun to share with you. Things that happened on trips that made us giggle, or little landmarks in our travel experience. Jump straight down to the box if you're ready to submit or comment. Our amusing little travel stories are listed below the invitation. If you don't yet want to add a little story of your own, feel free to comment on ours. 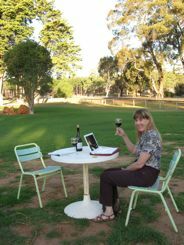 ...But truthfully, when you're traveling and having fun, it's not always easy to break away and write about it. Some trips it just isn't convenient to take a computer along. We left it home when we went to Madagascar. We took it to Dubai, but didn't take the time to use it much. We did use it a little on our Australian wine tasting adventure. 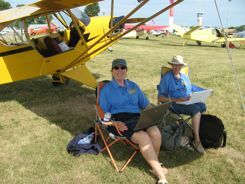 In Oshkosh, Wisconsin attending the EAA AirVenture 2009, we had wifi and free time to tell you about it. We sat under the wing of my sister's little Piper J-3 Cub and wrote about the Cub to Oshkosh flight. Other stories are just cute little vignette about our past or recent travels. Follow along -- and remember, with this form, you can add your travels too! It's easy. Promise! Do you have recent travels to share? This is the place. With all of our travel, I couldn't keep up with a daily blog, or with full travel stories. I'll share recent travels with you here... And Please... Share Yours with us! Your Recent Travel Destination Will Be Your Headline. Is there something you've seen and done that shouldn't be missed? Give us a brief tip or a whole story if you want. Do you have some travel pictures or graphics to add? Great! Click the button and find the first one on your computer. Select it and click on the button to choose it. Thanks for reading. We'd still love to have you comment or contribute. It really is easy and we'd love to hear your stories or comments. Don't be shy.